For the neighborhood also known as Old Chinatown, see East Downtown Houston. Chinatown (Simplified Chinese: 中国城, Hanyu Pinyin: Zhōngguóchéng) is a community in southwestern Houston, Texas, United States. It is roughly bounded by Fondren Road, Beechnut Street, State Highway 6, and Westpark Drive, and lies between Alief and the city of Bellaire. The naming of the new Chinatown is disputed, as various ethnic groups, especially Vietnamese, live within the community. Portions of Chinatown lie within the Southwest (formerly Greater Sharpstown), International, and Westchase management districts. There is another Chinatown called "Old Chinatown" located within the East Downtown Houston district near the George R. Brown Convention Center. The first businesses of the new Houston Chinatown opened in 1983. In the 1980s increasing numbers of Chinese were living in Southwest Houston and Fort Bend County and those residents were further away from the old Chinatown in what is now East Downtown. The new Chinatown began to expand in the 1990s when Houston-area Asian American entrepreneurs moved their businesses from older neighborhoods, especially the "Old Chinatown" on the eastern end of Downtown Houston (in the process of redevelopment), in a search for more inexpensive properties and lower crime rates (at the time). In 2005 Christy Chang, a tour operator who operated tours into Chinatown, said "This area is not just Chinatown anymore. If anything, it's Asia Town" due to the presence of various ethnic groups that developed in the community. The Asian American Business Council estimated that between 2004 and 2008 the land values along Bellaire Boulevard in Chinatown increased between 25 and 50 percent. In 2008 the group estimated that 2,000,000 square feet (190,000 m2) in construction would appear in the following two-year period. The group estimated that the construction would include high end condominiums. Lisa Gray of the Houston Chronicle stated that the development of the remaining acreage would likely cause rents to increase and that, compared to many other Chinatowns in the United States, the Houston Chinatown is still relatively inexpensive. In 2008 the Asian American Business Council placed a contest to design a "landmark monument" to be placed on Bellaire Boulevard between Beltway 8 and Gessner Road in order to increase visibility among Asian Americans and non-Asian Americans and to beautify the area. The Bellaire Chinatown is about 12 miles (19 km) southwest of Downtown Houston. It is over 6 square miles (16 km2), making it among the largest automobile-centric Chinatowns in the Southern United States. The Chinatown, located on a mostly treeless plain, is, according to Lori Rodriguez of the Houston Chronicle, roughly bounded by Fondren, Beechnut, State Highway 6, and Westpark, west of Bellaire. The half of the Rodriguez definition of Chinatown inside Beltway 8 is within the Greater Sharpstown district. The Greater Sharpstown Management District defines Chinatown within its borders as being a 2.37-square-mile (6.1 km2) area bounded roughly by Beltway 8, the Westpark Tollway, Beechnut, and Redding. Much of western Chinatown under the Rodriguez definition lies within the International Management District. A portion of the Rodriguez definition of Chinatown lies within the Westchase district. The community is between Westchase and the City of Sugar Land. Katharine Shilcutt of the Houston Press said that Chinatown was "straddling Beltway 8 on the southwest side like an entire city unto itself." The new Chinatown is located within a residential area of single-family houses and apartments, and its spread-out nature differs from the East Downtown Chinatown, which was in a relatively compact area. The businesses within the new Chinatown include a mall, supermarkets, shopping centers, restaurants, and bakeries. The street signs have Chinese characters. The Bellaire Chinatown has many "retail condos," shopping centers in which spaces are owned instead of leased. Many East Asian people prefer to own shopping places instead of renting them. In the United States "retail condos" are rare outside areas populated by East Asian Americans. The community has restaurants serving many kinds of cuisines, including Chinese, Hong Kong and Taiwanese, Filipinos, Indonesian, Japanese, Korean, Laotian, Malaysian, and Thai. In addition it has restaurants operated by ethnic Vietnamese that serve Louisiana-style crawfish. The community also has many fusion cuisine restaurants. Shilcutt said that "the restaurant density in this area is roughly equivalent to the population density of Vatican City." Lisa Gray of the Houston Chronicle stated that this Chinatown resembles newer Chinatowns that opened in automobile-oriented metropolitan areas in the United States such as suburbs in Greater Los Angeles and the Silicon Valley, as opposed to older, uniformly Chinese, pedestrian-oriented Chinatowns in New York City and San Francisco. Gray said that in older Chinatowns immigrant businesses cluster together by ethnic group, while in newer automobile oriented Chinatowns retail operations from different ethnic groups move in next door to each other. As of 2012, according to the Greater Sharpstown Management District the portion of Chinatown within the boundaries of the Greater Sharpstown district has 29,993 people. The clientele of this Chinatown tends to be middle class. Two Houston City Council districts, F and J, serve the new Chinatown. District J was created to allow Hispanics to more easily elect representatives who cater to them. The new Chinatown is served by two Houston Police Department patrol divisions, the Midwest Patrol Division and the Westside Patrol Division, of the Houston Police Department. The Midwest division operates the Ranchester Storefront (Simplified Chinese: 中国城警察局, Hanyu Pinyin: Zhōngguóchéng Jǐngchájú "Chinatown Police Station") in the Diho Square (Simplified Chinese: 顶好广场, Hanyu Pinyin: Dínghǎo Guángchǎng) complex. Fire stations located within Chinatown's boundaries include Station 10 Bellaire (Simplified Chinese: 第十号消防队, Hanyu Pinyin: Dìshíhào Xiāofángduì "Fire Brigade #10") and Station 76 Alief Community, both a part of Fire District 83. Station 10, previously located in what is now East Downtown, relocated to its current location in 1985. Station 76 was built in 1985. "Nearly a dozen" banks, including overseas Chinese banks and mainstream banks, are located along a less than 1 mile (1.6 km) stretch of Bellaire Boulevard, in proximity to Beltway 8. The clientele of these banks include area residents and Asian American entrepreneurs. Robert Lee, an executive vice president of MetroBank, said, "They call it the Wall Street of Chinatown." In the three decades before 2007, Wells Fargo had one of the few bank branches in the area. Businesspeople began to open Asian American ethnic grocery stores and seafood markets. In the 1980s Wells Fargo added signs in Chinese and hired tellers who spoke Cantonese, Korean, and nine other languages. During the same decade local businesspeople opened MetroBank and Texas First National Bank during a banking crisis that negatively affected the state's mainstream banks. George Lee, the president of MetroCorp Bancshares, said "All the banks were in trouble, and the ones that were not in trouble didn't understand the needs of the Asian community." American First National Bank and Southwestern National Bank opened in the 1990s. As of 2007 many Asian businesses operate in the area, and so Asian American banks have opened to cater to them. As of that year Washington Mutual (now JPMorgan Chase) was the last company to open a bank branch in that area of Chinatown. Texas First National is now known as Golden Bank. Southwestern National Bank has its headquarters in Chinatown and Greater Sharpstown. American First National Bank maintains a 12-story, $30 million headquarters building in Chinatown. MetroCorp Bancshares and subsidiary MetroBank previously had their headquarters in Chinatown and in Greater Sharpstown. Halliburton operates the Houston Office (a.k.a. Oak Park Campus) on 67 acres of land located in Chinatown and in the Westchase district. The complex includes the Latin America division of Easywell, a division of Halliburton. In 2009 the Westchase campus had 1,700 employees; Halliburton plans to increase its workforce at Oak Park to 3,000 workers. At the Bellaire site Halliburton plans to build a 16-story tower, a two-story "life center," an additional parking garage, expanded child care facilities, auditoriums, and bridges to connect the many buildings. In 2009 Halliburton had about 1,000 employees worked in leased office space in Westchase. During that year Halliburton stated that it planned to vacate the leased space. The plans for the Oak Park office had been delayed by one year, and Halliburton expects completion in 2013. The new Chinatown is served by two separate school districts: Most of the New Chinatown according to the Lori Rodriguez definition is served by the Alief Independent School District, while an eastern portion is served by the Houston Independent School District. The HISD portion of the community is within Trustee District VI, represented by Greg Meyers as of 2008. Zoned elementary schools (K-4) located within the Lori Rodriguez definition of Chinatown include A. J. Bush, Chambers, Chancellor, Collins, Hearne, Liestman, Mahanay, Martin, and Youens. In addition Sneed Elementary School, outside Chinatown, serves a portion of Chinatown. Bilingual students zoned to Chancellor attend Youens, and bilingual students zoned to Mahanay attend Hearne. Owens Middle School is a zoned intermediate school in Chinatown. Budewig, Miller, and Youngblood, outside Chinatown, serve portions of Chinatown. Middle schools in Chinatown include Alief Middle, Killough, and O'Donnell. A portion is served by Albright Middle, outside Chinatown. Regardless of location within the district, all Alief ISD residents may be randomly assigned to either Alief Elsik High School, Alief Hastings High School, and Alief Taylor High School; all of them are in Chinatown. In addition the magnet school Alief Kerr High School is in Chinatown. Neff and White Elementary Schools are located in the Houston ISD portion of Chinatown. Other portions are served by Emerson and Piney Point elementary schools. Most of the HISD portion is zoned to Sugar Grove Middle School and Sharpstown High School. A portion of Chinatown is zoned to Revere Middle School and Lee High School. Prior to 2011, Sharpstown Middle School served most of the HISD portion of Chinatown. The portion of the HISD portion of New Chinatown south of Bellaire Boulevard was zoned to Sharpstown High School, while the portion north of Bellaire Boulevard was zoned to Lee High School (With Lamar High School and Westside High School as options). For a period after 2011 the Sharpstown zone was assigned to Sharpstown International School for grades 6 through 12. Strake Jesuit College Preparatory and Saint Agnes Academy are in Chinatown. Metropolitan Transit Authority of Harris County, Texas (METRO) provides local bus services to the area. Chinese holidays are celebrated in this Chinatown. The Chinese Community Center (CCC, Chinese: 休士顿中华文化服务中心, Hanyu Pinyin Xiūshìdùn Zhōnghuá Wénhuà Fúwù Zhōngxīn, "Houston Chinese Culture Service Center"), an IRS 501(c)(3) organization and a United Way affiliate, is located at 9800 Town Park Drive. The facility opened in 1979 as the Chinese Language School. The CCC has several levels of English classes offered daily. As of 2006, at CCC about 80% of the students have university degrees, and the other 20% are the companions of the students with university degrees. Rodriguez, Nestor. "Hispanic and Asian Immigration Waves in Houston." in: Chafetz, Janet Salzman and Helen Rose Ebaugh (editors). Religion and the New Immigrants: Continuities and Adaptations in Immigrant Congregations. AltaMira Press, October 18, 2000. ISBN 0759117128, 9780759117129. Also available in: Ebaugh, Helen Rose Fuchs and Janet Saltzman Chafetz (editors). Religion and the New Immigrants: Continuities and Adaptations in Immigrant Congregations. Rowman & Littlefield, January 1, 2000. 0742503909, 9780742503908. 1 2 3 4 5 6 7 8 9 10 11 Rodriguez, Lori. "Opinions vary over naming the growing Asian community on Houston's southwest side." (Archive). Alternate version without Chinatown map: "DIVERSITY DEBATE / Chinatown outgrowing name / Opinions vary over naming the growing Asian community on Houston's southwest side." Houston Chronicle. Wednesday May 9, 2007. A1. ↑ Patel, Purva. "Pay-for-visa plan could revive Houston's Old Chinatown." Houston Chronicle. August 18, 2008. Retrieved on January 20, 2009. 1 2 3 4 5 6 7 Gray, Lisa. "Branding Chinatown: Neighborhood transforms." Houston Chronicle. January 8, 2008. Retrieved on August 11, 2011. 1 2 3 4 5 Rodriguez, Nestor, p. 39. ↑ Moreno, Jenalia (2009-10-17). "Chinatown no longer". Houston Chronicle. Retrieved 2009-10-19. 1 2 3 4 5 Schilcutt, Katharine. "Top 10 Restaurants In Chinatown." Houston Press. Wednesday June 16, 2010. Retrieved on June 17, 2010. 1 2 3 "Districts Archived January 6, 2009, at the Wayback Machine.." Greater Sharpstown Management District. Retrieved on August 15, 2009. 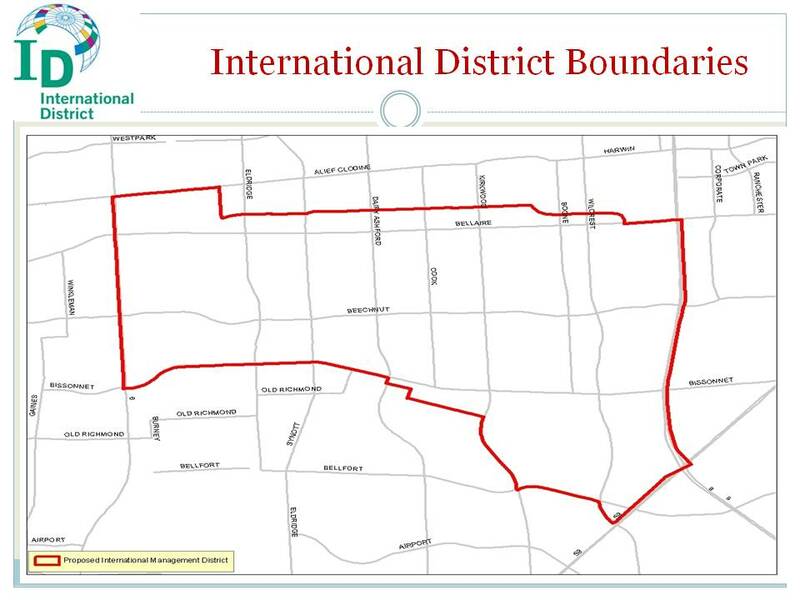 ↑ "International District Boundaries Archived 2011-07-26 at the Wayback Machine.." International District. Retrieved on May 2, 2010. 1 2 "SECT5-key.gif Archived February 27, 2009, at the Wayback Machine.." Westchase District. Retrieved on January 13, 2009. ↑ "SECT4-key.gif." Westchase District. Retrieved on June 2, 2010. ↑ Kaplan, David. "Houston Chinatown tries 'retail condo' concept." Houston Chronicle. May 16, 2009. Retrieved on May 19, 2009. ↑ City of Houston, Council District Maps, District F Archived 2012-06-25 at the Wayback Machine.." City of Houston. Retrieved on November 5, 2011. ↑ City of Houston, Council District Maps, District J Archived 2012-01-31 at the Wayback Machine.." City of Houston. Retrieved on November 5, 2011. ↑ Shauk, Zain. "Hispanic-opportunity district draws three candidates." Houston Chronicle. Friday October 14, 2011. Retrieved on November 4, 2011. ↑ "Crime Statistics for Westside Patrol Division." City of Houston. Retrieved on November 29, 2008. 1 2 "VOLUNTEER INITIATIVES PROGRAM – Citizens Offering Police Support." City of Houston. Retrieved on September 23, 2008. 1 2 "Police Stations and Neighborhood Storefronts." Houston Police Department. Retrieved on May 27, 2010. ↑ "Home." Diho Square. Retrieved on July 27, 2010. ↑ "Fire Stations." City of Houston. Retrieved on May 7, 2010. ↑ "Fire Station 10." City of Houston. Retrieved on May 8, 2010. ↑ "Welcome to EaDo." East Downtown Management District. Retrieved on August 1, 2009. ↑ "Fire Station 76 Archived 2007-08-07 at the Wayback Machine.." City of Houston. Retrieved on May 8, 2010. 1 2 3 4 Moreno, Jenalia. "Houston's 'Chinatown' near Beltway 8 sparks banking boom." Houston Chronicle. Sunday February 18, 2007. Retrieved on October 16, 2011. ↑ "National Bank List (P-S)." Comptroller of the Currency Administrator of National Banks of the U.S. Department of the Treasury. Retrieved on December 27, 2010. "Southwestern National Bank	Houston	TX"
↑ "Locations Archived 2011-07-16 at the Wayback Machine.." Southwestern National Bank. Retrieved on December 27, 2010. "Main Branch 6901 Corporate Drive Houston, Texas 77036." ↑ "Contact the Board." MetroBank. Retrieved on December 27, 2010. "Corporate Secretary MetroCorp Bancshares, Inc. 9600 Bellaire Blvd. Suite 252 Houston, TX 77036 United States ." ↑ "Contact Us Archived 2010-11-26 at the Wayback Machine.." MetroBank. Retrieved on December 27, 2010. "MetroBank, N.A. 9600 Bellaire Blvd., Suite 252 Houston, Texas 77036"
↑ "Office Location." Halliburton. Retrieved on January 13, 2009. 1 2 Clanton, Brett. "Halliburton to consolidate in 2 locations." Houston Chronicle. April 3, 2009. Retrieved on April 3, 2009. ↑ Sarnoff, Nancy. "Halliburton move could create hole in Houston's office market." Houston Business Journal. Friday August 10, 2001. Retrieved on November 11, 2009. ↑ "Easywell Offices Archived 2010-06-01 at the Wayback Machine.." Halliburton. Retrieved on April 3, 2009. ↑ "HALLIBURTON TO CONSOLIDATE HOUSTON OPERATIONS Archived 2015-07-20 at the Wayback Machine.." Halliburton. April 3, 2009. Retrieved on January 22, 2010. ↑ Dawson, Jennifer. "Despite delays, suburban Halliburton campus developments take shape." Houston Business Journal. Friday December 25, 2009. Retrieved on April 5, 2010. ↑ "2007–2008 Elementary School Boundaries." Alief Independent School District. Retrieved on June 2, 2010. ↑ "2007–2008 Elementary School Bilingual Boundaries." Alief Independent School District. Retrieved on June 2, 2010. ↑ "2007–2008 Intermediate and Middle School Boundaries." Alief Independent School District. Retrieved on June 2, 2010. ↑ "Neff Elementary Attendance Zone." Houston Independent School District. Retrieved on June 2, 2010. ↑ "White Elementary Attendance Zone." Houston Independent School District. Retrieved on June 2, 2010. ↑ "Emerson Elementary Attendance Zone Archived 2011-08-14 at the Wayback Machine.." Houston Independent School District. Retrieved on June 2, 2010. ↑ "Piney Point Elementary Attendance Zone Archived August 14, 2011, at the Wayback Machine.." Houston Independent School District. Retrieved on June 2, 2010. ↑ "Access Denied" (PDF). www.houstonisd.org. Retrieved 11 April 2018. ↑ "Revere Middle Attendance Zone Archived 2009-02-27 at the Wayback Machine.." Houston Independent School District. Retrieved on June 2, 2010. ↑ "Lee High School Attendance Zone Archived February 3, 2007, at the Wayback Machine.." Houston Independent School District. Retrieved on October 16, 2011. ↑ "Sharpstown Middle Attendance Zone." Houston Independent School District. Retrieved on June 2, 2010. ↑ "Sharpstown High School Attendance Zone Archived 2012-02-14 at the Wayback Machine.." Houston Independent School District. Retrieved on June 2, 2010. ↑ "Lee High School Attendance Zone Archived February 3, 2007, at the Wayback Machine.." Houston Independent School District. Retrieved on June 2, 2010. ↑ "Sharpstown Middle Attendance Zone." Houston Independent School District. Retrieved on October 16, 2011. ↑ "System Map Archived October 31, 2008, at the Wayback Machine.." Metropolitan Transit Authority of Harris County, Texas. Retrieved on December 11, 2008. ↑ "Welcome to the Chinese Community Center." Chinese Community Center. Retrieved on March 11, 2009. ↑ Rodriguez, Lori. "TRANSLATING A NEED / Language barriers / Immigrants see English as vital, but work, family limit time to learn." Houston Chronicle. Monday September 18, 2006. A1. Retrieved on December 30, 2011. Swartz, Mimi. "New Chinatown, Houston." Texas Monthly. February 2008. Wikimedia Commons has media related to Chinatown, Houston. "Chinatown" (Archive). Greater Sharpstown Management District. Asian American Business Council – Official New Chinatown Website for Detail Restaurants Guide, News, Entertainment and Cultual Event Schedule. eBao – Asian American Lifestyle Online News – eBao News Magazine covered Asian Community Business Events and Development.